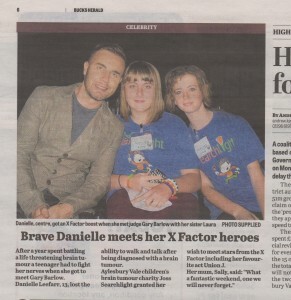 Danielle, centre, got an X Factor boost when she met judge Gary Barlow with her sister Laura After a year spent battling a life threatening brain tumour a teenager had to fight her nerves when she got to meet Gary Barlow. Danielle Leefarr, 13, initially lost the ability to walk and talk after being diagnosed with a brain tumour. Aylesbury Vale children's brain tumour charity Joss Searchlight granted her wish to meet stars from the X Factor including her favour-ite act Union J. Her mum, Sally, said: "What a fantastic weekend, one we will never forget."